The Bangor Fire Department rescue a dachshund owned by local resident Anne Fenner on Saturday after the dog vanished down a culvert and got stuck. Bangor Fire Dept. photo. 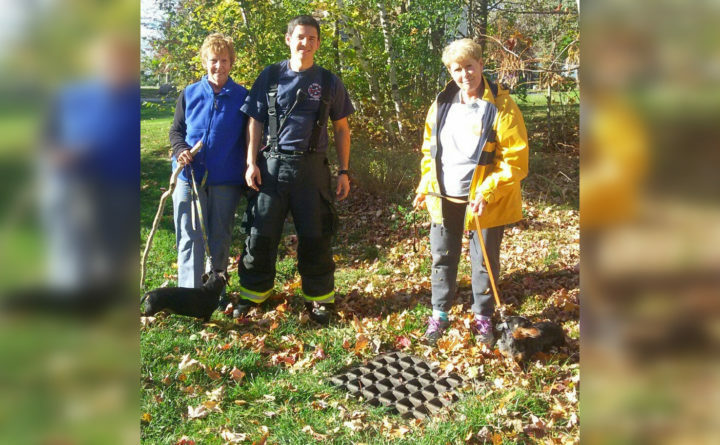 Fiona, a miniature dachshund, got a little more than she may have bargained for Saturday afternoon when her expedition into a drainage culvert ended with a rescue operation by the Bangor Fire Department. The adventure began when Fiona’s owner Anne Fenner was walking her dogs in the field behind Bangor High School and Fiona got off leash and made a break for it. Knowing there was a culvert not far from where Fiona was heading and knowing the dog’s love for exploring anything resembling a tunnel, Fenner said she had her suspicions where the dog had ended up. The culvert passed under a street and Fenner said she followed its route to a sewer grate between Orchard Hills Parkway and Baldwin Drive and when she looked down, there was Fiona looking back up and crying. Unsure what else to do, Fenner dialed 911 and within minutes, the crew from Bangor Fire Department Engine 6 was on the scene. Wellman and crew members Joel Burda and John Goulet were able to get the grate open and extend a ladder down the 4-feet or so to Fiona. Burda then climbed down and retrieved the bedraggled, but otherwise uninjured dachshund while Fenner and Fiona’s far less adventurous brother Frankie looked on. Wellman said he and his fellow firefighters have rescued dogs from burning buildings before, but this was the first rescue operation from a culvert for them.